It is important to describe the forests of Nova Scotia today, including how they are changing over time. The Nova Scotia Department of Natural Resources (NSDNR) forest inventory program monitors many elements of today's natural resources and thereby captures changes over time. The inventory data helps us make informed choices on sustainable forest management. 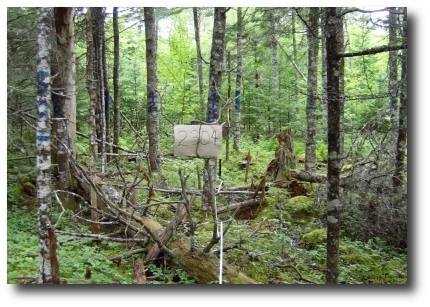 The forests of Nova Scotia are monitored by two complementary measurement systems: Photo Interpretation and Permanent Forest Inventory Plots (Inventory Services). Data analysis is used to define and track many forest components, such as volume and growth, and results in various reports. The data also provides a basis for modeling volume, biomass and carbon. This valuable database is regularly shared with academia, industry and other governments. How much biomass is contained in the forests of Nova Scotia? While there are many sources of forest biomass, very few of them are widely used as forest products today. The exception would be the merchantable tree component for which biomass is estimated in this report. Products from merchantable sized trees are widely used in the forest industry and the co-generation/energy industry in Nova Scotia.